Speedo swimsuits work well for the summer swims. If you are looking for a suit that works well for the summer months when the weather is warmer, you will want one that is lightweight. Choosing a suit that comes in fun patterns can help make your summer swims more enjoyable as well. Speedo swimsuits come in several styles and patterns that will carry you through those summer swims with the same precision as the rest of the year. The Flyback style of suits is a great option for those who are looking for Speedo swimwear that will last a long time. Each of these suits offers a wider strap across the middle of the back with thin straps over the shoulders to provide the support swimmers need and a streamlined fit so you can cut through the water cleanly. The Python Flyback is created with Xtra Life Lycra Fiber. This fabric holds its shape and resists deterioration due to exposure to the chlorine, sweat and sunscreen better than suits that are made from spandex. If you prefer the Speedo Endurance + fabric, you can choose between the Circuit Board or Off the Grid designs. This fabric is extremely stretchy, giving the suit a tight fit and the ability to hold its shape well. Another great style for the summer Speedo swimsuits is the Y-back style. This style is true to its name with thin shoulder straps that lead to another thin strap that stretches across the back. These suits come in the Dazed Maze design and are made with the lightweight Speedo Endurance + fabric. In addition the stretchy qualities of this fabric, it also weighs less than other types of fabrics, making it a great choice for your summer suit, especially for those long training and practice sessions. The Speedo Superback style of swimsuit affords you the thin straps of the Y-back style with the added support of crossed straps in the back. If this is your preferred style, you can find this piece of Speedo swimwear in the Blamo Camo design. 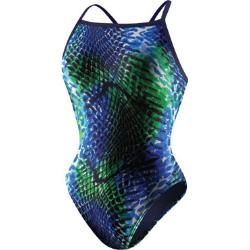 This suit is also made with the lightweight Speedo Endurance + fabric due to all its benefits. If you are looking for Speedo swimwear for the summer, you can find what you are looking for with the lightweight, durable suits available. From the Xtra Life Lycra Fiber to the Speedo Endurance +, you will receive all the benefits of a suit that fits well and doesn’t interfere with your movement through the water.